Ideally located near the seafront and adjacent to the golf course. 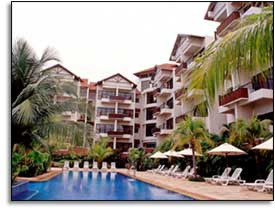 It is set in a resort ambience with lush green landscaping. The rooms are tastefully furnished and self-contained with bedrooms, dining and lounge areas and kitchenette. The hotel features meeting rooms and function halls, pool and Jacuzzi, Tennis courts. The Cheers Pub is a great place to unwind and socialize.